Watchdogs Not Celebrating Obama Group's Switch On Big Donors : It's All Politics Organizing for Action, which was formed from the Obama for America campaign committee to promote the president's second-term agenda, now says it won't take money from corporations or PACS. Critics say they'll believe it when they see it. 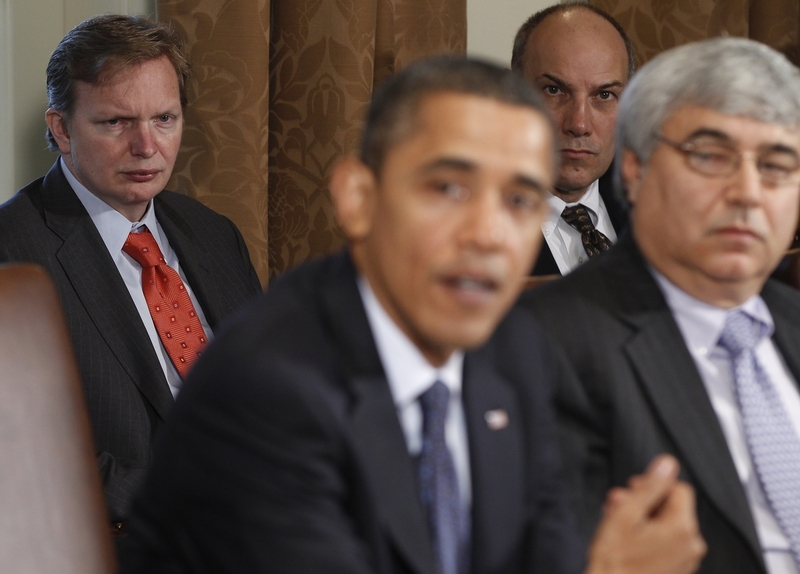 Jim Messina (left), the head of Organizing for Action and a former top Obama campaign and White House aide, watches President Obama make a statement in the White House Cabinet Room in 2010. Caught between the gritty political realities of needing cash and being linked to a political leader who has repeatedly denounced money's influence in Washington while raising record sums, former campaign aides to President Obama appeared to side with the money. That had opened officials now heading Organizing for Action — which was formed from the Obama for America campaign committee to promote the president's second-term agenda — to charges of hypocrisy. Criticism for their refusal to swear off taking cash from corporations, lobbyists and overseas donors may have had the intended effect: On Thursday, the new OFA announced it wouldn't take such boodle. But if the former Obama campaign officials running OFA have decided to be the change they wish to see in the world (or at least to look like it), some government watchdog groups aren't buying it. The Sunlight Foundation's Lisa Rosenberg wrote a blog post titled "OFA — A Dark Money Group by Any Other Name," and called the group "a tiger that can't change its stripes." "Organizing for Action's mission is to put power back into the hands of the American people. That's why we won't accept a single dollar from corporations, PACs, foreign donors or lobbyists. This is your movement, not theirs." "While Organizing for Action is a nonprofit social welfare organization that faces a lower disclosure threshold than a political campaign, we believe in being open and transparent. That's why every donor who gives $250 or more to this organization will be disclosed on the website with the exact amount they give on a quarterly basis. We have now decided not to accept contributions from corporations, federal lobbyists or foreign donors." "Under OFA's 'voluntary' system of disclosure, there is no enforcement mechanism to ensure that big money donors will be disclosed, or whether the group is sticking to its commitment to prohibit corporate and foreign contributions. There is nothing to prevent a CEO from writing a big check to OFA, only to be reimbursed from her corporate coffers — laundering a corporate contribution. The only legally enforceable rules that apply to OFA are the same ones that apply to every other dark money 501(c)(4) organization — and we know how well those work." The controversy wasn't only due to what seemed like OFA's willingness to take contributions from all comers. It also involved a reported plan to give the biggest donors access to the president several times a year. OFA's announcement underscores the difficulty the Obama team has had in matching the rhetoric of reform with the practical business of campaigns or of governing. It's a balancing act Obama himself has found tricky from his first presidential campaign in in 2008. Then, like now, he railed against the corrupting influence of political money. But he also decided against entering the public campaign financing system. If it was to reserve his ability to raise enough money to counter anything Republicans might throw at him, it worked, and then some. He outraised and outspent Republican John McCain by more than a 2-to-1 margin, swamping his opponent in available cash in the key final weeks of the race. As president, Obama has banned federal lobbyists from jobs in the administration, ostensibly to reduce special-interest influence, to the continuing unhappiness of many lobbyists. But he also granted waivers that let some lobbyists work in the White House or elsewhere in the administration. "I'm pleased to see that the President's associates have reconsidered their initial decision to solicit corporate contributions and sell access to the President through OFA and that they've pledged to make full and prompt disclosure of all gifts of $250 or more. ... But that's really just a start."